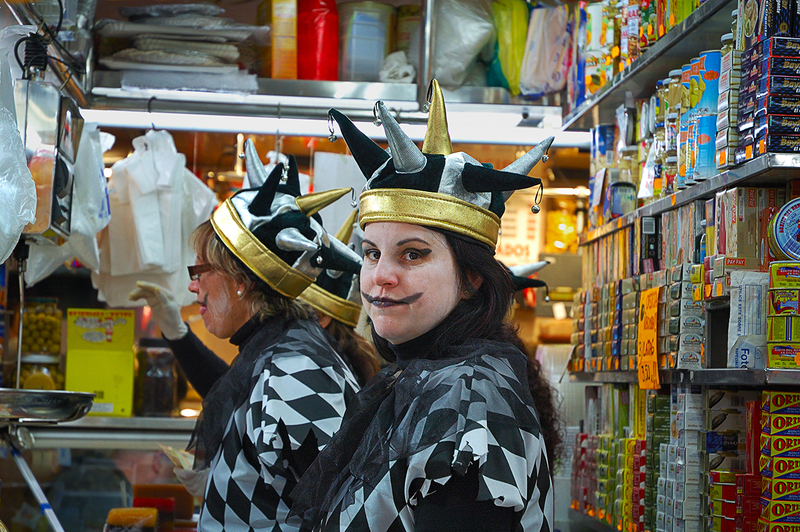 Another picture from this particular series taken in La Merce market last weekend during Barcelona carnival celebrations. I guess it is not very comfortable to work wearing a joker costume but it all helped cheering up the season and the lousy weather. In spite of the upturned mouth, this lady does not look all that happy. Maybe it was the lousy weather? we do whatever we can to make the best of a situation! what a picture, says so much, so true about that saying, a picture is worth a thousand words! I didn't realize, until I saw your photos, that Carnival involves everyone wearing costumes. Kind of like Halloween. Usually I imagine New Orleans parades with floats and Rio parades with dancers. See how educational CDP is?! Great pictures, as usual, Carlos. Looks like they are having fun and being funny on the job! Happy Carnival!